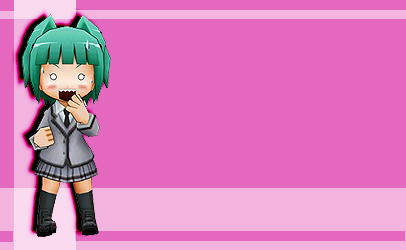 You reached Glass Mask, the fanlisting dedicated to Kayano Kaede, one of the main characters of the series Ansatsu Kyoshitsu (Assassination Classroom)! Kaede is my favourite female character of the series~ ❤❤ Though she's almost always passive during the begin and the run of the series, she's really adorable when it comes about many things and I like a lot her attitude towards the others and especially Koro-sensei! >w< I'm still trying to catch up with the manga so that I can know her better, but I know for sure that I won't be disappointed since I have high expectations! ❤ And well... I don't think we have in common a little complex, no (that's just Mother Nature's fault). Ansatsu Kyoshitsu and related characters are property of Matsui Yusei and Lerche. Layout and contents are ©Miriallia do not steal or reproduce~ All the images I used are from Google.com, if you think they belong to you, just drop me an email, I will credit you~!